This is a unique collection of photographic portraits, picturing over 200 artists who responded to the request, "Look at this stone and express what you feel in front of the camera". 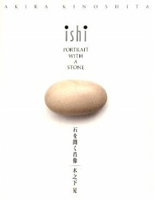 The pieces in this book are from the "Ishi: Portrait with a Stone" series of photos taken through close interaction with musicians spanning 20 years. The stone is a catalyst that provides a glimpse at a different side of artists active on the international stage. This is a photo book celebrating the 5th anniversary of the opening of MUZA KAWASAKI Symphony Hall. It pictures the stage performances of close to 50 maestros from around the world, including Simon Rattle, Riccardo Muti, and Valery Gergiev. Not available in market, but if you want to purchase it please contact us. 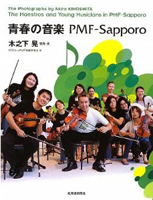 The Pacific Music Festival (PMF) held in Sapporo each July is an international educational music festival that was founded by Leonard Bernstein in 1990. To commemorate the 20th PMF, around 200 photos taken by Akira Kinoshita over the years were collected in this book. More a picture-book with photos than a photo book, it depicts the history of PMF through stunning photography that conveys the appeal of this music festival even to those not familiar with it. This photo book commemorates the 50th anniversary of the stage debut of José Carreras. 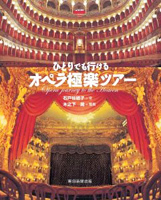 This beautifully bound and printed deluxe photo book depicts his opera and recital performances in Japan from his first visit in 1974 through to 2006. It is a limited edition said to be coveted by his fans. This popular guidebook for opera fans is packed with information on opera tours from the writer and photographer. It contains photographs of picturesque theaters and towns along with essays filled with travel information, as well as behind-the-scenes details of operatic works and theaters and useful tips such as how to obtain tickets. This guidebook is acclaimed for its vivid depiction of theaters, performances, and towns. 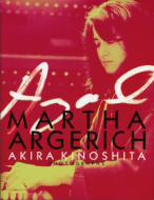 This photo book captures the allure of Martha Argerich on film, following her career from her first visit to Japan in 1976 over more than three decades. Argerich is a top Argentine pianist. She enjoys a great deal of popularity, with her concerts in Japan selling out in minutes. Kinoshita is able to build close friendships with musicians, and he succeeds in capturing the true face of Argerich, who is known to hate cameras. 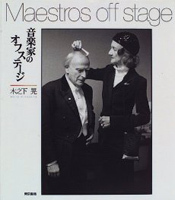 This photo book contains a unique treasure trove of photos, including gems such as Angelica's solemn expression as she devotes her energy to her music on stage, and the look on her face as she relaxes with Seiji Ozawa and others backstage. This photo book details a photo exhibition held at the JCII Photo Salon operated by the Japan Camera Industry Institute. 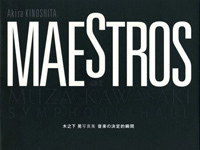 It contains around 80 monochrome photographs personally selected by Kinoshita, including shots of conductors Hideo Saito, Takashi Asahina, Seiji Ozawa and Kazushi Ono, pianists Kazuko Yasukawa and Mitsuko Uchida, violinists Mari Iwamoto, Akiko Suwanai, and Midori Goto, and opera singers Atsuko Azuma, Yasuko Hayashi, and Yoko Watanabe. This was the first time Kinoshita produced a collection consisting solely of Japanese musicians. This book is a must-read for music fans, featuring an international music photographer and a leading opera expert exploring the heartland and image of Italian opera virtuoso, Verdi. "The Maestros" contains 184 shots meticulously chosen from 30,000 rolls of film that Kinoshita had accumulated over the years. The book's design was handled by Mitsuo Katsui. This new book was put together by the same people behind the out-of-print "Musicians of the World", which many wanted to see a new edition of. An English translation of the interviews was added, making this compilation of Kinoshita's work around the world accessible to an international audience. Kinoshita photographed renowned 20th century composer Toru Takemitsu over almost 30 years, from the 1970s until his passing in 1996. 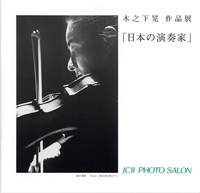 This set includes a large number of photographs that capture the atmosphere created by Toru Takemitsu's music, as well as a CD incorporating rare recordings. The CD includes the interview "Toru Takemitsu talks about his youth" (broadcast by NHK in 1984), in which Toru Takemitsu discusses his younger days and the works he created, as well as three pieces of music not found in the Complete Takemitsu Edition collection. This is a book long awaited by fans of Takemitsu's music. 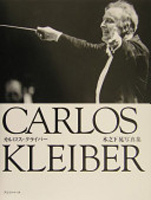 A photo book of the legendary conductor Carlos Kleiber. 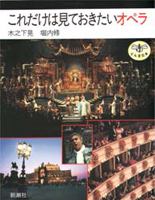 With the majority of the photographs taken at his concerts with the Bavarian State Orchestra on May 10 (Tokyo Bunka Kaikan) and May 11 (Kanagawa Prefectural Civic Hall) in 1986, it also includes shots from the curtain call of the La Scala performance of "La Bohème" in Japan on September 25, 1988 (Tokyo Bunka Kaikan), and the curtain call and after party on the last day of the Vienna State Opera performance of "Der Rosenkavalier" in Japan on October 20, 1994 (Tokyo Bunka Kaikan). The late Takashi Asahina lived to the age of 93, and was active throughout his life. This maestro, who did some of his best work in his 80s, was one of rare few who truly lived life to the fullest. Through trust built over many years of friendship Kinoshita was able to capture the private life of Takashi Asahina, revealing his way of life through a wealth of photographs and essays. 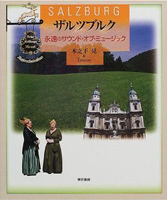 This book lets you rediscover the ageless charm of Salzburg, city of music, through a journey exploring the locations used in the movie "The Sound of Music". Music photographer Akira Kinoshita, who has frequented Salzburg for 27 years, captures the stunning beauty of the city of music on film. This is the perfect companion for a trip to Salzburg. In recent years many have found new appreciation for Beethoven. This book examines his accomplishments, reflecting on the life of this true artist and composer who perfected classical music by exploring the cities he called home, including Bonn, Vienna, and Prague. 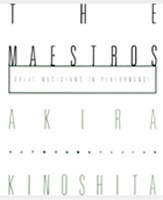 This delightful book contains photos capturing maestros in a new light off the stage, including Yo-Yo Ma with a yo-yo, Plácido Domingo holding a paper lantern, Takashi Asahina arranging conductor's batons in a vase, and John Cage eating soba noodles. It is fair to say that the popularity of opera in Japan is now well established. However, it is likely that many fans are lost when it comes to working out which performances to see. This book offers a definitive selection of 50 opera masterpieces. It is a best-selling handbook indispensible for opera fans that summarizes the audiovisual highlights in compact form. 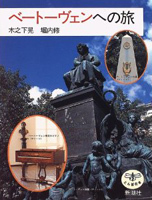 This book combines essays written by author Kunio Tsuji with a homage to Mozart through the photography of Akira Kinoshita. Commemorating the 200th anniversary of Mozart's death, the photographs chronicle his life, from his birthplace to the theaters and palaces where his masterpieces were created. 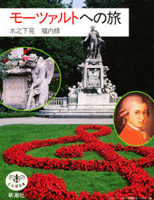 It is the perfect gift for a fan of Mozart. Mozart is still loved to this day, 200 years after his death. Though he lived a short life of just 35 years, he spent most of it traveling, and his observations and impressions from these journeys shaped his most famous works. Tracing his travels to over 30 European cities through a bounty of photographs, this book reflects on the accomplishments of this passionate genius while examining his life from a new perspective. It is one of the best selling books in the "Tombo no Hon" series.